This is also the personal story of how Marla’s husband and children handled the shattering news — told in their own words — and how the family came together to achieve newfound balance in their lives. Friends, family, health-care professionals and co-workers rallied to support Marla at this most challenging of times. And Marla, irrepressible as always, bravely ventured out into the world, frankly discussing her health and sharing her positive outlook in her newspaper column and on national television. A story infused with emotion, humour and strength of spirit, this book is for anyone whose life has been touched by cancer or any other life-threatening condition. Dr. Marla Shapiro is a Certificant of the College of Family Physicians of Canada and a Specialist in Community Medicine. She is an Associate Professor in the Department of Family and Community Medicine at the University of Toronto and has her own family practice. The medical consultant for CTV News and Canada AM, she also hosts the show Balance: Television for Living Well and has a bi-weekly column in The Globe and Mail. 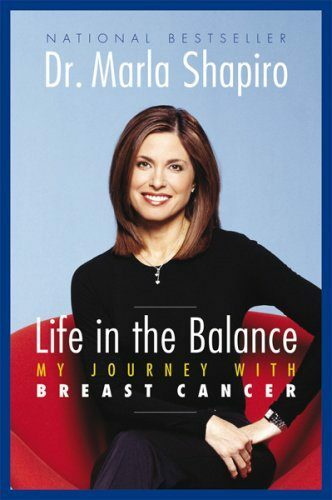 Dr. Shapiro is the recipient of the 2005 Media Award from the North American Menopause Society for her work in expanding the understanding of menopause, and in 2006 she won the Society of Obstetricians and Gynaecologists of Canada/Canadian Foundation for Women’s Health Award for Excellence in Women’s Health Journalism for her documentary Run Your Own Race. She lives in Toronto with her family.